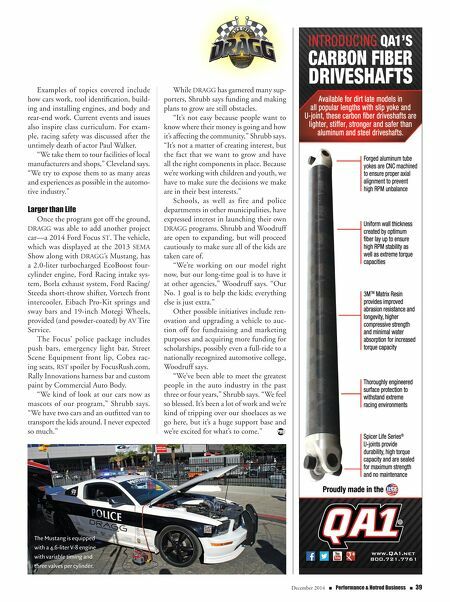 38 n Performance & Hotrod Business n December 2014 PERFORMANCE hp on the dyno (a typical police car is about 300 hp), is equipped with a 4.6- liter V-8 engine with variable timing and three valves per cylinder. Other additions include a Vortech Supercharger, Borla exhaust system, Eibach Pro-Kit springs and sway bars, 18-inch Foose Nitrous Legend wheels provided and installed by Oxnard's AV Tire, and custom paint by Oxnard-based Commercial Auto Body. The vehicle also features a police pack- age with push bars, emergency light bars, custom spoiler, Cervini's Auto Designs front lip and carbon fiber hood vents. Once the car was built, the officers decided to establish an educational pro- gram for juniors and seniors in high school. "We decided to do the program at the high school level because at the teenage age, you have to make so many decisions," Shrubb says. "For our name, we picked the two worst things in our city—gangs and graffiti—and drag racing, because we're always trying to race toward the finish line in some way. We're trying to help kids race toward success." The first DRAGG program kicked off in 2011 with fewer than 10 kids; now classes have typically more than 20 students. Classes take place in a 2,300-square-foot facility located in close proximity to the high schools, so kids can bike and walk to the building after school if they can't drive. "We concentrate on high school stu- dents, but we don't turn away kids," Shrubb says. "If a kid shows up at our program, they may not say it, but they're asking for help. If you need us, we're here." The program offers students credits for participating in after-school classes twice a week. "We take them to tour facilities of local manufacturers and shops," says instructor Darrell Cleveland. "We try to expose them to as many areas and experiences as possible in the automotive industry." 'Just a Couple of Cops' Woodruff and Shrubb joke that they are "just a couple of cops," but DRAGG's success proves otherwise. DRAGG students and staff members have even had the opportunity to meet and discuss the pro- gram with celebrities such as auto industry great Carroll Shelby, race car drivers Justin Bell and John Force, custom car designer Mad Mike and the Batmobile creator George Barris—to name a few. DRAGG also gives students the oppor- tunity to participate in an auto shop atmosphere they might not have access to at their high school, often due to lack of funding for the subject. "We pick up the slack for schools where kids aren't able to do automotive," Woodruff says. "They can come over to us and get exposed to the auto industry." Darrell Cleveland, "Mr. C," has taught automotive for more than 27 years and began teaching for DRAGG in 2012. While the subjects Cleveland covers in DRAGG are very similar to the ones he teaches dur- ing the school day, he says the after-school course's three-hour time frame and smaller class sizes allow him to dive deeper into subjects and formulate more close relation- ships with students. "We're watching kids get serious about careers in general, specifically automotive- related in some way or another," Cleveland says. "So that's been really neat to see." Classes take place in a 2,300-square-foot facility located in close proximity to the high schools.